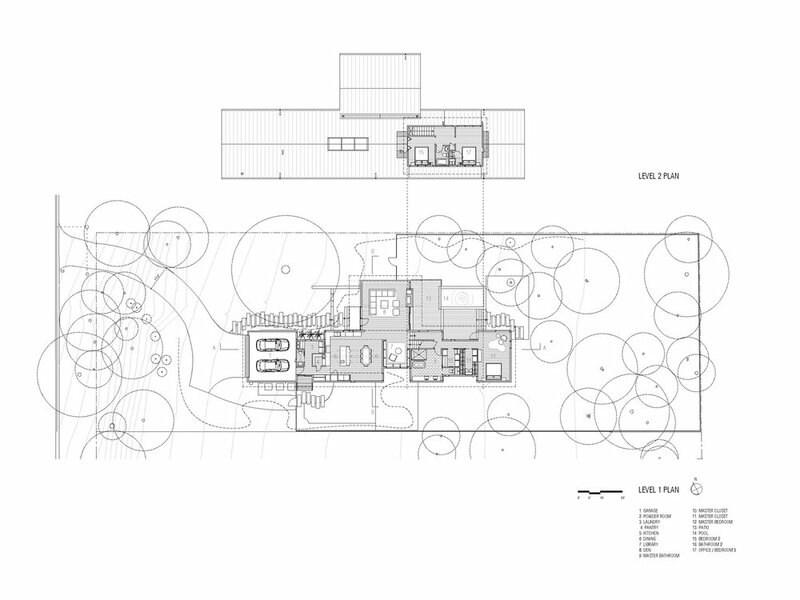 collector's house — A Parallel Architecture. Austin, Texas. Commissioned by former New York city art collectors as their forever home, the limited footprint of this primarily single level structure floats above its gently sloping pastoral lot, threading between heritage oaks and ligustrum groves. Defining parallel gables recall the agrarian neighbors and house interior spaces of varying scale and form, each conceived around the diverse art collection they serve. Two adjacent vaulted spaces are respectively hallmarked by a ridgeline skylight that washes the kitchen and dining area below, while the expansive glass of the living room focuses views out towards the sweeping tree line. Sleeping rooms and a reading nook are rigorously nestled within the underlying forms, each connected by an ordered plan that offers interior views that stretch the length of the house. Terraced wood decks bridge between a stone massing wall and a plunge pool perched above the native landscape running below.